Two Class 309 electric multiple units coupled together at London Liverpool Street. One of these is in Network SouthEast livery and the other is in "Jaffa Cake" livery with "Essex Express" branding. The British Rail Class 309 "Clacton Express" electric multiple units (EMUs) were built by British Rail (BR) York Works from 1962-1963. They were initially classified as Class AM9 before the introduction of TOPS. 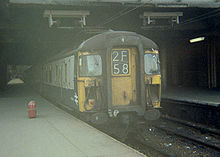 These units were the first express 25 kV alternating current (AC) units to be built by British Rail, and British Rail's first EMUs to be capable of 100 mph. 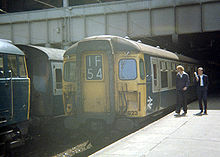 Wikimedia Commons has media related to British Rail Class 309.